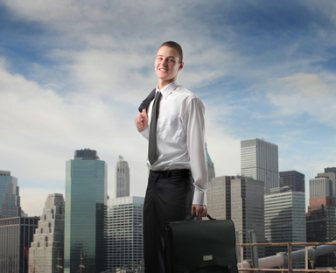 Corporate Job or Start Up - What's Best? Recent college graduates aren't about to turn down an entry-level job offer from a brand name corporation, especially in this economy. The salary is livable, benefits commence in 90 days, and a certain level of prestige and respect come along with it as well. These are generally the reason job seekers will select the corporate job over the startup position, even when the difference in salaries is negligible. The benefits of working for a startup before taking the plunge into the corporate world may not be of the medical and dental types, but can definitely improve the health of your career in the long run. The fact is small businesses generally need the services of larger, more established corporations to get up and running. A company like Pitney Bowes may be the choice for marketing solutions, while several different providers may handle information technology. These partnerships give the startup employee the experience of communicating and tendering transactions with their corporate counterparts. The resulting indirect relationship provides a way to be exposed to corporate processes without actually working for the corporation. As an entry-level associate for a large corporation, your job description and duties are already mapped out and will likely remain the same unless you're promoted (or demoted). Startups generally have far fewer employees who wear multiple hats. Though you were brought onboard as a sales representative, you also have experience writing, and with SEO from your days working for the college newspaper. This will create the opportunity for you to approach CEO, whose office is right around the corner from your cubicle, and volunteer to take on the task. The chances of you actually sitting down and speaking with the chief executive of a large corporation are slim-to-none. The opportunities to pick the brain of the company founder, exchange ideas, and watch the company grow before your eyes are priceless, and can prepare you in potentially starting your own business. The more responsibility you have, the more impressive your resume will look when/if you decide to leave the position for another job opportunity. An inevitable expense when you work for a corporation will be a trip to the department store to buy a few pairs of khakis, collared shirts, and shoes to accommodate their business-casual dress code. Most startups allow employees to wear jeans and T-shirts, which creates a relaxed, casual environment. There is generally a stronger sense of belonging and co-workers are nowhere near as uptight as they are in a corporate setting. The best part about working for a startup is that you're getting paid to learn how a company goes from a five-employee dream to a 500-employee money machine. Everybody in the building wants to be a part of the company's growth, and the creative spirit is contagious.